Oath of Ajani is a strategy-specific mana accelerator that might just change everything. Decks that want to play their Planeswalkers early will want to play Oath of Ajani early. Decks that have a lot of creatures might want to cash in on Oath of Ajani by playing it late(r). Some decks have both lots of Planeswalker and lots of creatures! The most obvious use case is to play your Oath on turn two… Then follow up immediately with a turn three Gideon, Ally of Zendikar. Lots of decks fold to a Gideon when you play him on the usual schedule… But turn three? That is going to be a straight up game winner. Open on Oath of Nissa for G.
Turn three play Chandra, Torch of Defiance. You can [+1] Chandra to add RR to your mana pool… And then immediately play Nissa, Voice of Zendikar! Nissa, Voice of Zendikar [normally] costs 1GG to play. But because of Oath of Ajani, Nissa costs effectively GG. Oath of Nissa lets you spend mana of any color to cast Planeswalkers. Ergo Chandra’s RR can pretend to be GG. So… “GG” (opponent)! This is a reasonably tame use case. What if you went G, GW, 2BU instead? Discounts and rainbows are both at your command between Oath of Nissa and Oath of Ajani. In any case, this is a heck of a turn three! You got to tick up the loyalty on Chandra and probably will have a Plant token to block. Next turn, with a land drop, you will have access to at least four mana (six with Chandra) meaning you can easily deploy two four mana Planeswalkers; maybe an even bigger payday! The Oath isn’t quite a Crusade. Creatures have to be in play when you play the Oath to get the buff; but it is worth noting that the card is reasonably cheap, and putting a bunch of +1/+1 counters on an undetermined number of creatures is definitely something you might want to do. 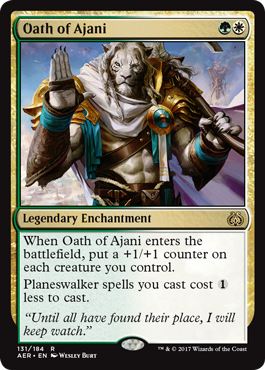 We can see playing Oath of Ajani in a regular creature deck… But also in Planeswalker decks that produce lots of token creatures. It can be good friends with 0/1 Plant tokens, 2/2 Knights, Liliana’s Zombies, etc. If you haven’t subscribed to the Top Level Podcast Instagram yet, what are you waiting for? Can you afford to miss the impending Flores Swimsuit Calendar? 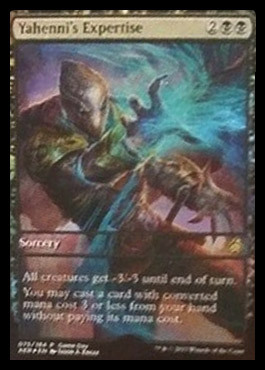 In the meantime, at least check out our podcast “trailers” … This week’s mostly talked about another Aether Revolt card: Tezzeret, the Schemer. So… No swimsuit calendars (yet) but some fun, actually podcast related stuff for now. The opponent sacrifices a creature or planeswalker. The opponent discards a card. You return a creature or planeswalker from your graveyard to your hand. Patrick’s argument is that, five mana against five mana, Dark Intimations far outstrips Tidings; Tidings was of course a Staple in Standard with “just” the text “Draw four cards” on it. Let’s set aside for a moment the possibility you don’t actually get four cards when you cast Dark Intimations. Obviously you will sometimes cast this card when you don’t have a creature or planeswalker in your graveyard, or your opponent doesn’t have any cards in hand. That’ll happen sometimes… And sometimes you will get a full four in a fashion that compares favorably to Tidings. The argument is that while drawing a card is approximately the same as drawing a card, forcing the opponent to sacrifice a creature or planeswalker is worth more — in the range of 1B or 2B. Moreover, returning a creature or planeswalker to your hand is more powerful, generally, than plucking a random card off the top of your deck. The “Bolas planeswalker” clause makes this card very interesting. The assumption is that you cast Dark Intimations prior to the Bolas planeswalker (powering it up)… But you don’t have to in order to get the bonus. For instance, you can discard Dark Intimations to Tormenting Voice or Cathartic Reunion just to load up Bolas. Give “The Advantages of Dark Intimations” a listen! 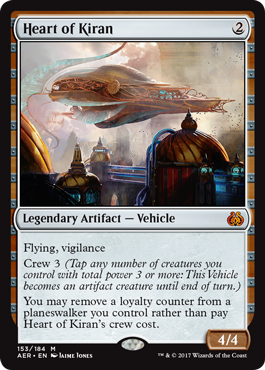 Heart of Kiran is one of the exciting new vehicles from Aether Revolt.We know from Smuggler’s Copter how good a two mana vehicle can be. Aether Revolt is pushing that limit even more with Heart of Kiran. Make no mistake… This card might be bananas. Imagine playing Heart of Kiran on turn two, then following up with Liliana or Nissa on turn three. You can slam with the Heart of Kiran and still gain ground on the battlefield by destroying a threat or making a Plant. You basically get to access Planeswalker loyalty twice per turn. The first use is the regular one; the second is a swing with Heart of Kiran. Because Heart of Kiran has vigilence, it can block. Got a spare loyalty? You can spring a 4/4 blocker on demand. The best thing? At least early in the Heart’s career, you may be able to steal a body or two. Some of the cards in Aether Revolt — most notably Ajani Unyeilding — imply a Planeswalker collective deck. Heart of Kiran might be great in that kind of deck, a two drop that comes down faster than any Planeswalker in Standard, and capable of thriving in a context rich with loyalty. As explosive as the loyalty-leeching alternate crew cost may be, the regular crew cost on this card is challenging. Crew 3 is much harder to hit than Crew 1; Nissa was already struggling in a Smugger’s Copter-first format, but at least Gideon could make 2/2 creatures. Now even [one of] Gideon’s tokens need assistance. Not a fatal flaw to this card at all… But something, certainly, to be wary of as you select your creatures. Yahenni’s Expertise is like a Languish married a Bloodbraid ElfIt’s that time again! Top Level Podcast’s favorite time… Spoiler season. Early Aether Revolt spoilers bring us three new cards to talk about: Yahenni’s Expertise, Trophy Mage, and Scrap Trawler. -3/-3 hits a surprisingly sweet spot in the current Standard. Not only is -3/-3 for all creatures not all that bad for 2BB, tons of the best creatures in Standard have three toughness, like Reflector Mage and Spell Queller. While Yahenni’s Expertise doesn’t give the full -4/-4 that Languish does, the additional ability to cast a card for no additional mana might make this card a powerhouse. For example, you can sweep the board and cast a card drawing spell in one move. In Modern, you might play Yahenni’s Expertise and pop an Ancestral Vision! The secondary ability on Yahenni’s Expertise can act as a kind of color fixing. Don’t be surprised if players cheat a little with this card, splashing additional colors they wouldn’t easily be able to cast. Trinket Mage and Treasure Mage* have a new cousin! The number of cards you can find with this is huge, varied, and highly flexible. For instance you can lock some opponents out with Ensnaring Bridge… And lock others out with Crucible of Worlds. Psst… Oblivion Stone costs three mana. * Incidentally, Patrick made Top 8 of PT Paris a few years ago packing Treasure Mage for Mindslaver and Wurmcoil Engine only!